Guest of honour Deacon Blue drummer Dougie Vipond attended this year’s opening ceremony held at the Banchory Lodge Hotel, where he praised the recovery effort which allowed the annual event to go ahead. The first cast of the season usually takes place at Potarch Bridge, between Banchory and Aboyne. However, the historic structure has been closed to all traffic and pedestrians after Storm Frank caused significant damage to the foundations. More than one hundred people gathered on the bank of the river in glorious sunshine yesterday to mark the start of the 2016 season and to watch Dougie cast the first line. 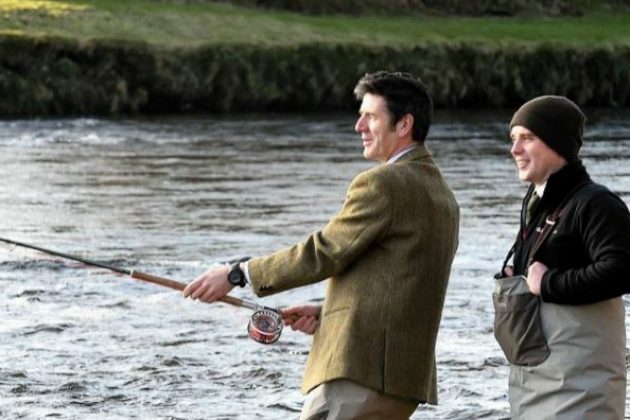 Mark Bilsby, river director of the Dee District Salmon Fishery Board, said the recent flooding had caused extensive damage to fishing infrastructure on the River Dee. But he said they were striving to ensure it is “business as usual”. “We now hope that despite the difficult start to the year it will be another successful season – the river is very important locally and many people live off it,” he said. Sports presenter Dougie praised the community for keeping the annual tradition alive. “I love this country and I love seeing how remarkable the community has been here at working together to keep the river beautiful so that future generations are also able to enjoy it,” he said. “It’s also fantastic to see people’s passion for the river and their love for their local area and because of this everyone has come together incredibly well to help others and to make the Dee a fantastic place. River Dee councillor, Karen Clark, said: “The big turnout of many different people at the opening shows the strength of support for the river’s role in our community and its huge contribution to our local economy.